For a parent who is raising vegetarian children, this book can come in quite handy. 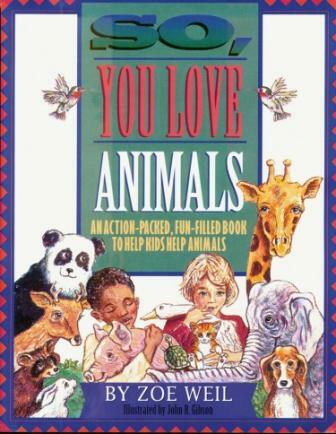 It’s a good resource for finding things to do with your children that can help them get involved with learning more about animals and their habitats, and helping to care for them. The book covers such topics as meat, companion animals, animals in entertainment, dissection, animal laboratories, and animals in the wild, offering pertinent facts about each. There are also projects the kids can undertake to help them learn more about the issues. Some of the projects in the book that parents can help their children do include making a bird feeder and bath, keeping the beach clean, making wind chimes using natural materials like seashells, and ways to get active in helping to protect wildlife. Depending on personal preferences, some parents may not care for the “be a zoo reporter” project because it involves visiting the zoo. However, it does lay out the facts and concerns with zoos, and provides a list of questions aimed at getting kids to take inventory of what they see wrong with zoos, and then to take steps to try and make things better.